HTC promised to roll Android Lollipop for HTC One M7 GPE a month ago and as per promise the company started rolling out 5.1 Lollipop update. It seems that HTC is little late in rolling out the update, but it’s always better late than never. 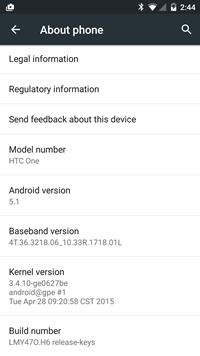 We have got the HTC One M7 GPE OTA link, check below for download. The update is only 5.1 nor the 5.1.1. Even no Nexus or GPE with a cellular rado has received Android 5.1.1 update yet. The update brings the build number LMY470 similar to that of M8 GPE smartphone and weighs about 280 MB. There should be S-OFF on bootloader of your HTC One M7 smartphone in order to manually flash OTAs in the stock recovery. If you doesn’t have these option, you need to spam the “check now” button. Already updated One M7 GPE phone to Android 5.1 Lollipop OS, then do share the changelog in the below comment section.